I noticed this comment and it kind of perfectly encapsulates what is so wrong with so many gamers’ responses to criticism. 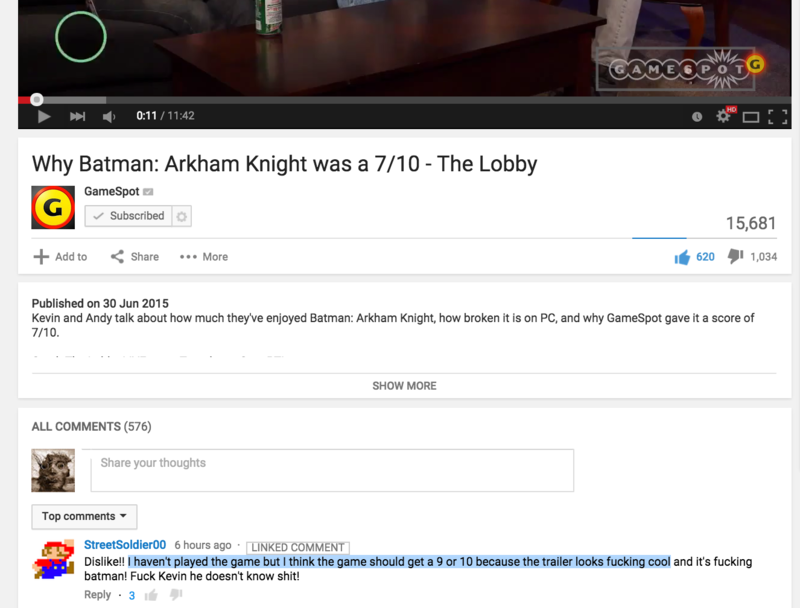 Yes: A person who admits to not playing Arkham Knight thinks it should get a higher score, based on a trailer. Because, I guess, trailers are never created to show off the best parts of the game, running perfectly smoothly, with the right set pieces, by a huge corporation’s marketing team. It’s not like it’s their job to sell you on a product of theirs based on decades of experience in marketing. It’s strange because clearly this person could just ignore this review or Kevin’s perspective in their purchasing decision. (You’ll notice that this person asserts Kevin knows nothing about games, an accusation I know all too well as of late.) As someone who adores Arkham Knight, I can see where Kevin is coming from. That was his experience and it actually resonates with a great many other people. The key to writing a good review should be that even those who disagree can still pick up on those aspects they’d love: For example, Kevin noted how often you use the Batmobile. He found that tiresome. However, I love the Batmobile and I loved the parts where I had to use it. So his response to the same scenarios are exactly the opposite of mine: there’s no arguing there, it’s simple fact that our tastes just differ. It’s strange that someone who clearly has been swept up in the PR to purchase the game feels the need to defend it against someone who’s played it (and is clearly an experienced critic). Kevin isn’t stopping you; he didn’t say it was bad; he gave it a 7 not an 8 or 9 like most other places. That people who haven’t played it are taking issue with the score should tell you so much about how so many gamers respond to criticism in general. It’s tiring dealing with such responses. But we haven’t reached that point where such responses are the exception rather than the constant: Too many gamers want everything and everyone to be mouthpieces for PR, rather than individual, critical perspectives on our favourite medium. It’s pretty much established that the subset of gamers who react like this are called “fanboys”. Although StreetSoldier00’s comment is pretty much textbook Poe’s law – people post stereotypical responses on purpose as jokes under popular YouTube videos all the time so it was probably a joke. I just can’t understand this mindset that so many gamers are infected with. Well, beyond blind tribalism that is. When I’m trying to decide where to spend some of my limited gaming budget, I often check reviews. I look at the negative or lower scored revues first. It’s usually pretty easy to figure out if the lower scores are due to matters of taste or preferences, just a bunch of nitpicking, or because the game is a wreck. The ones based on difference in taste are even very useful, really. If a COD fan loves a game for x, y, and z reasons, those same things would probably make me regret wasting my money on that game. But if someone who has similar taste likes a game I had no interest in at all, that definitely makes me reconsider and take a closer look. I said on Twitter that I had no interest whatsoever in the Witcher 3 until reading Tauriq’s review and tweets about the game. And that’s completely true, the trailers and promos for the game made it look like just another grim-dark ragey-angsty game. Now I’m considering buying the game, though I’m torn between it and Arkham Knight. I watched my brother play Arkham. We howled with laughter at the Batmobile. Every time Batman faced a puzzle, challenge, enemy combatant, plot twist, or setback of any kind, one of us would suggest the winch. It was usually the right call. It’s a great testament to the power of marketing over the weak-minded, isn’t it. 🙂 I doubt that this is exclusive to gamers though, after seeing heaps of similar comments regarding all kinds of newly-launched popular culture products that had a bit of marketing hype. The same insecurity that makes people easily manipulated by “everyone thinks it’s great!” marketing messages is the same thing that then makes them defensive about liking the product.